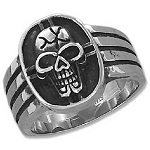 Spinner rings are taking the fashion world by storm this season, and JustMensRings.com has just the solution you need to elevate your everyday ensemble. 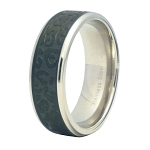 Our blue stainless-steel spinner ring serves as a fashion statement and a brain game all in one convenient package. Spinner rings such as these were originally worn in ancient Buddhist communities. Tibetan monks wore spinning cylinders of metal to perform various prayers and rituals. The spinning motion is believed to help calm the mind while decreasing negative energies from a stressful day. Our men’s blue stainless-steel spinner ring can be worn as an everyday accessory or a wedding band to commemorate the special relationship you share as a couple. Our blue stainless-steel spinner ring features a unique center inlay that looks especially great when paired with blue accessories or other pieces of jewelry. Modern men are straying away from precious metals, and stainless steel is one of the most popular alternatives to date. Stainless steel is beloved for its durability and resistance to tarnish, corrosion, and scratches. 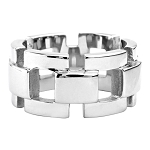 Best of all, stainless steel rings are available at a fraction of the cost compared to white gold or platinum. 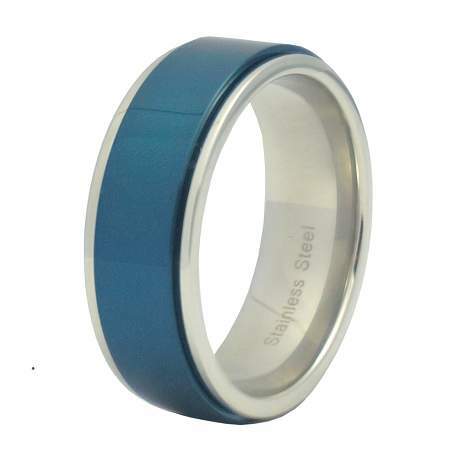 Each men’s blue stainless-steel spinner ring features an 8mm band and a traditional fit with a center inlay that’s made from a vibrant blue ion plating. Before finalizing your order, we recommend that you have your finger measured by a professional jeweler to determine whether a traditional fit is right for you and your lifestyle. If you have any questions, please don’t hesitate to contact us today for more information.